The Milnerton Coastline and some of the towns in it have featured quite significantly over the years in the history of Cape Town. 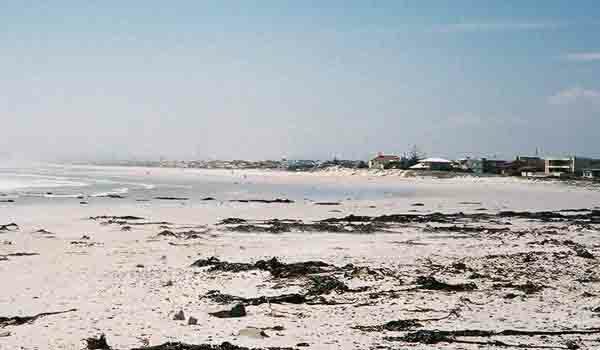 The towns of Melkbosstrand, Bloubergstrand and Milnerton were all part of the history of the invasion by the British in 1806. Due to the war between Dutch and France back in 1805 the British were scared that there interests in using the route to the east around Cape Town would be blocked by the French and the Batavians (Dutch) who were resident at the Cape at the time. The British sent a force of 63 ships and 7000 troops to the Cape to secure their interests here. On arrival here in the Cape they were unable to land in Table Bay due to gale force winds so anchored off Robben Island and eventually landed their first troops on the beach at Losperdsbaai (Melkbosstrand today.) The landing did not go according to plan and 32 Highlanders were drowned as their boat capsized in the surf. This prompted the British to run a ship aground on the beach to protect their boats as they came ashore. After landing their troops the British marched them along the Table Bay coastline towards Cape Town. A battle for the high ground around Blouberg caused many losses on both sides with the Dutch eventually retreating and giving up the fight. The British marched on and took Cape Town with very little resistance. Today the Blouberg Hill is still there but the British of old would not recognise it. The whole area has been caught up in the urban spread towards the north of Cape Town. Houses are being built at an alarming rate where the British once conducted their attack on the Dutch forces who were attempting to stop their advance on Cape Town. Rietvlei where the Dutch set up camp to defend the British advance and which was bombarded by the British fleet thinking that the Dutch were still ensconsed there is still there today. It has become an important wetland area where many thousands of birds spend their summers. 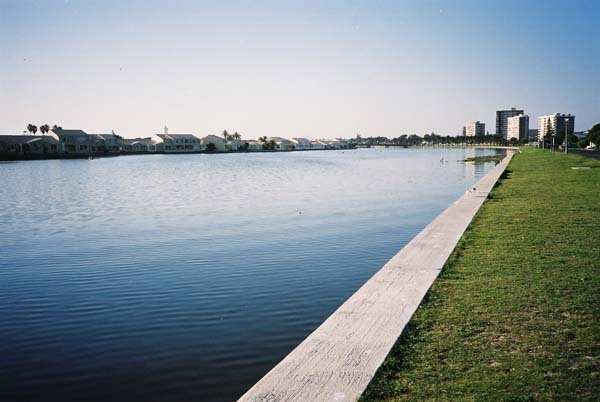 Milnerton, a suburb of Cape Town was built on the banks of what is today called the Milnerton lagoon. The lagoon forms part of the Rietvlei wetlands and is the only access to the sea for the whole wetland area. Milnerton is an upper class residential area and has some beautiful old houses. Unfortunately due to the spread of industry to the north of Milnerton and the consequent attraction of jobs for the masses a number of shanty towns sprang up. Marconi Beam being one of them.Of course when an area is targeted by the unemployed masses crime increases and that is what has happened in this area. The authorities however decided thata shanty town right in the middle of an upper class area could not continue and built housing for the people at De Noon a couple of kilometres to the north of Milnerton and moved the people there. Milnerton has a lot going for it. A new growth area in the town is being developed with the closure of the Ascot Race course. The area surrounding it however still has stables for the many horses that are kept in the area. In the days of old when the British needed to defend the coastline the Milnerton lagoon presented them with a problem of gaining access to the sea. To solve it a wooden bridge was built over the lagoon. This bridge was used by golfers and beach goers to gain access to the beach until about 10 years ago when a modern road bridge was built over the lagoon. 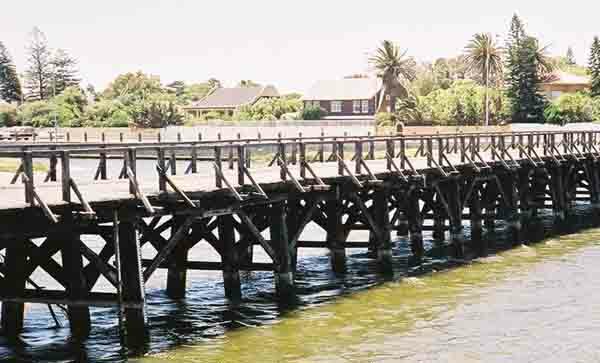 The wooden bridge is still there today and is used by pedestrians and children for fishing into the lagoon. Milnerton golf course has been built on the island that has been formed by sand dunes which are between the lagoon and the sea. The Milnerton Lagoon with the island housing estate on the left. It is a links course, has 18 holes, and is set out down the length of the coastline towards the north. The first nine holes are played down wind (Milnerton being one of the windiest places in Cape Town) and the return is a real challenge facing into the the teeth of the howling south easter. Nearby is the Milnerton Lighthouse which was erected in 1960 to assist shipping arriving in Table Bay at night. The lights of Table Bay harbour blend into the lights of the city making it extremely difficult to find a safe anchorage at night. Milnerton, although many of the views from the houses are blocked by large trees still has the most beautiful view of Cape Town and Table Mountain . It must have been this view that prompted the people of old to establish a village there. When you visit Milnerton take a walk down to the beach to see the sun set over Table Mountain and Table Bay. You might even find me there.